‘Wet sucket’ is one of the more unappetizing culinary terms I’ve run across, but Markham and his contemporaries would have understood it as referring to fruit in syrup. 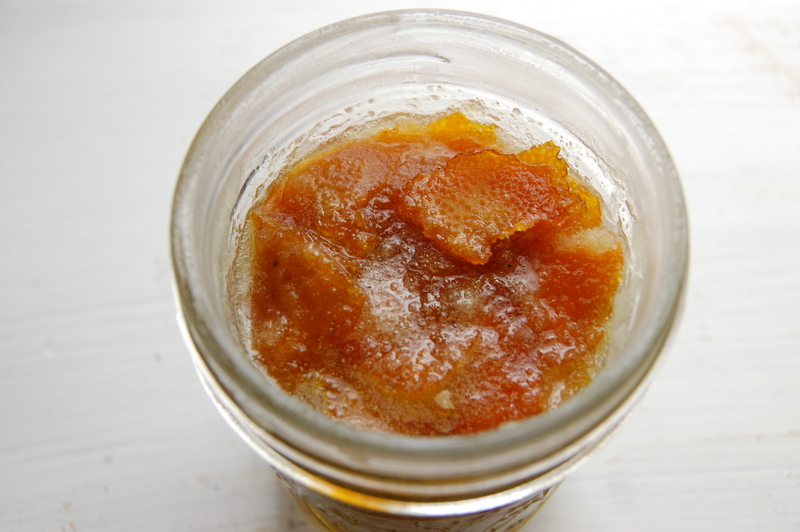 The Oxford Companion to Food indicates that wet suckets and dry suckets (candied fruit) appeared in England in the early 17th century, right around the time Markham would have been compiling The English Housewife. They were made using fruit, but also vegetables, roots (like Angelica root), and nuts. Markham’s recipe may require a bit more adaptation than the other ones I’ve worked with, both because of size and ingredients. Take curds, the parings of lemons, of oranges or pomecitrons, or indeed any half ripe green fruit, and boil them till they be tender, in sweet wort; then make a syrup in this sort: take three pound of sugar, and the whites of four eggs, and a gallon of water; then swinge and beat the water and the eggs together, and then put in your sugar, and set it on the fire, and let it have an easy fire, and so let it boil six or seven walms, and then strain it through a cloth, and let it seethe again till it fall from the spoon, and then put it into the rinds of fruits. There are quite a few terms in there that may be worth explaining: wort (or sweet wort) is “the liquor made by an infusion of malt in water, from which beer and ale are fermented” (Best, 312). As awesome as I think home brewing is, I haven’t jumped on the bandwagon yet, so I don’t have the actual malt water that they need. My internet browsing suggests (and please correct me if I’m wrong!) that wort is the substance you have prior to adding the hops. I don’t have any malt here (and I suspect not all my readers keep it around either), so I’m going to cheat (I know, and I’m sorry). Malt is just a sprouted grain using in brewing and distilling, and while I don’t have any wort laying about, I do have malt whiskey. I know it’s not the same, but I’m hoping that adding a little bit of it to the water will be close-ish to the flavor Markham was going for. The amount of sugar Markham asks for is pretty steep too (almost 7 cups) which may warrant halving the recipe to keep me from having to buy more bags of sugar. A few other terms in the recipe you may not know are pomecitron (which, as far as I can tell, is a member of the citrus family although I haven’t found a really thorough description yet), swinge (to whip or beat), and walm (boil). I haven’t found any modern recreations of the wet sucket, so I played it by ear when determining how thick my syrup should be. Since I’m making the fruit in syrup today (and not regular suckets, which are more like hard candy) I won’t want the syrup to completely harden when it cools! There are a couple things to point out when doing this recipe: first of all, you want to heat the egg white mixture slowly and stir it often so you don’t end up with scrambled eggs. Also, don’t whisk it too vigorously (like I did in the beginning) or you’ll end up with fluffy meringue on top of your syrup. If you do get a couple bits of egg that harden, just scoop them out with a slotted spoon. Markham suggests straining the mixture, which leads me to believe that this might be a problem inherent in the recipe. When you’re finished, you’ll have a really thick syrup (egg white has been used as a thickener in foods and binder in all sorts of things, including photographs). Just toss your fruit in there and toss to coat, then put it in a jar! Using a vegetable peeler, peel strips of orange rind, being careful to not get too much of the bitter white pith. Cut into bite sized pieces (1/4″-1/2″ long). Whisk egg whites into water until incorporated. Heat slowly over medium-low heat, stirring frequently to ensure that the egg doesn’t scramble. While heating, add the sugar to the water, 1/2 cup at a time. Boil for 30-45 minutes, or until the syrup is very thick (for those who have made caramel, you want it to coat a spoon in the way caramel sauce does). 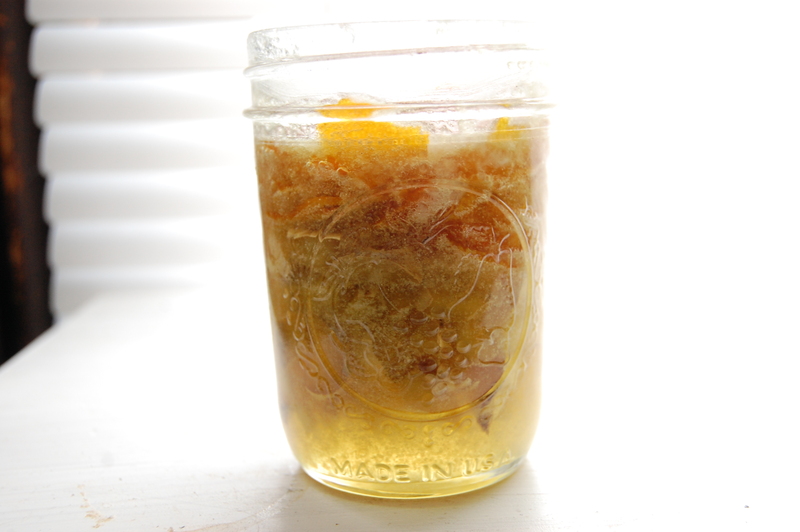 Let cool slightly, then toss the orange peels into the syrup and pour the mixture into a jar. A few hours after posting this, I discovered that the top of the syrup in the jar crystallizes somewhat. This means you can lay the candy out on a wax paper-lined cookie sheet and the sugar should crystallize (although it won’t turn into a hard candy, just a slightly crunchy exterior).